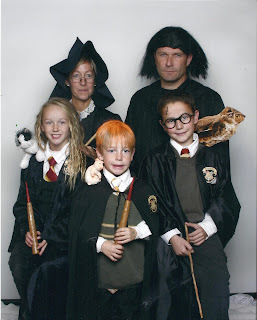 Halloween Costume for 2009 was Harry Potter! The Characters were: Professor McGonagall, Professor Snape, Hermione Granger, Ron Weasley and Harry Potter. Hermoine has her pet cat Crookshanks on her shoulder, Ron has his pet rat Scabbers on his shoulder and Harry has Hedwig the owl on his shoulder. Each has a wand. For the crest patch I copied it and and ironed them on black choir robes. Curled Hermione's hair, spray painted Ron's and of course the scar on Harry's head. can't get enough of dad's face in this one. Yes, a great Snape! My favorite part of these pictures is seeing the number of participants dwindling - very funny. Ha! He is trying to look like Snape :) and my serious expression? Found you through the CBC blog and of course I have to follow you because we have a lot in common. I was raised in a family of nine kids, and I have 7 myself. I remember you from the CBC, now that I see your picture. Neat blog!